1. School officials at the Merriam School in Acton, Massachusetts have embarked on a project to convince the Red Sox and Yankees to shake hands prior to their season opening contest. The project was a response to high tensions between Red Sox fans and Yankees fans at the school during the Red Sox’s seven game triumph last year. Jose thinks this is an interesting way to deal with conflict between children over a sporting contest. But Jose has a better idea… deportation. This happened in MASSACHUSETTS… Yankees fans have infiltrated the schools? They’re trying to turn our own children against everything that is good and decent and American. Jose even has it on good authority that there are dozens, if not hundreds of Yankees fans at the State Department and even in the U.S. Army. Jose says to the principal “Have you no decency, sir? Have you no decency?” It is time for us to drive them into the sea. And no, Jose has not been reading too many books about the Balkans. Well, okay… maybe a few too many books about the Balkans. George Steinbrenner has already endorsed the plan, as one might expect from a big loser who lost. Loser. Neal expected to reach the majors earlier in his career, but suffered a serious setback when a big name scout, a Mr. Guffman, failed to show up for the one and only pitching performance of his high school career. 3. In Jose’s opinion, this is really, really stupid as Bonds finished his statement “I have finally jumped.'' The city of San Francisco would do better to invest its resources in search and rescue. 1. Yikes! Jose has definitely hit the dreaded dead arm period of spring training, when his fastball has no zip, his curveball has no curve and everything he can’t write anything funnier than a Jimmy Kimmel monologue. (Note: That is to say, not funny.) Maybe it’s just that there’s no news, but Jose’s writing feels lethargic. And God knows, writing about the stadium situation is never the cure for lethargy, and yet write about the stadium situation Jose shall. How could he not write about the stadium situation? The Red Sox announced yesterday that they plan to remain at Fenway Park for the rest of human history. This is a little bit like if the Greeks had announced their plans to hold the 2004 Olympics in the original 1896 Olympic Stadium. It’s a lot cheaper, and a lot easier, but it may not be completely practical. Of course, the Red Sox are convinced otherwise. They truly see their future in the old yard. This is a stark departure from five years ago, when the Harrington regime insisted that a new stadium was essential to securing the team’s economic future and Jose was a young PR flack doing drips and drabs of work to help tear down baseball’s greatest stadium. Jose was at the legislative hearing where the Red Sox asked for state aid for a new park. He sat immediately behind Dan Duquette and can confirm that up close, his hair cut looks even worse. 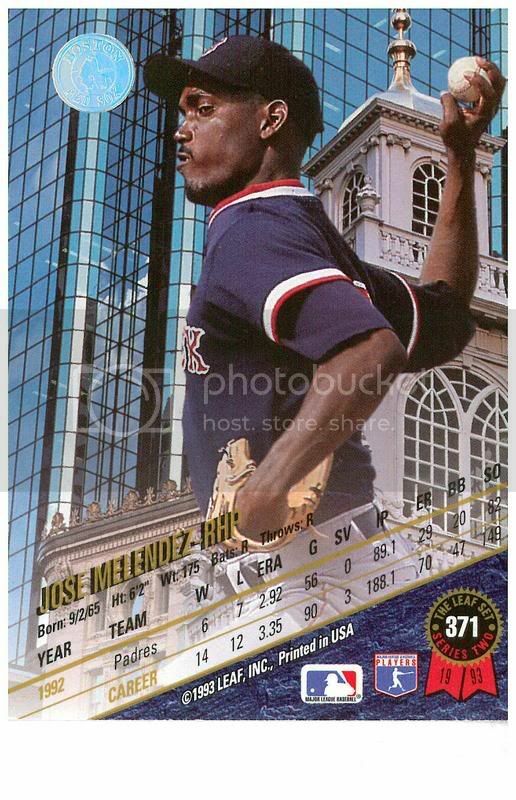 Jose spread the gospel that Fenway was architecturally unsound, financially unviable and experientially inadequate. And now, five long years later, he learns that none of it was true. It turns out Fenway is architecturally sound, it is financially viable and it is experientially superior. 2. A number of states have adopted anti-gay marriage laws that explicitly define marriage as the union of “one man and one woman.” You may have read about it; it was in the news. Here’s what Jose wonders: Do these laws invalidate Megatron Lowe’s marriage? After all, they say nothing about the union between woman and machine. In addition would Senator Amidala’s marriage to Anakin Skywalker be valid? He has a robotic arm, so technically, he’s a cyborg. 3. Despite his struggles over the past year and the criticism he recently endured from catcher Doug Mirabelli, not everyone has given up on Korean submariner B.K. Kim. In fact, amidst the piles and piles of Red Sox themed books that were written to capitalize on the team’s championship season there is even one about the troubled reliever. Jose saw it at the bookstore the other day. It’s by Rudyard Kipling.